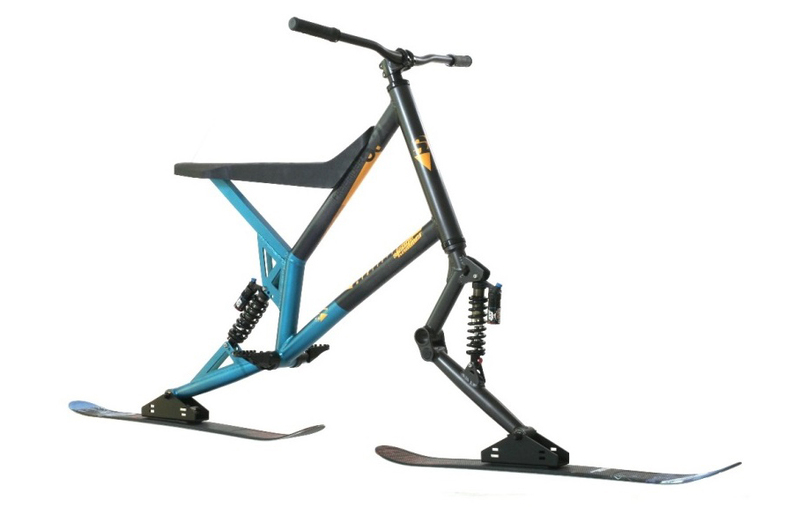 A compete Skibike at the price of a conversion kit. Ever thought of biking the mountain after the snow has fallen! If so, there are two ways of going. Converting your mountain bike to a skibike or buying a complete Skibike setup. The Sledge Hammer Freerider 5.1 is a compete Skibike priced just as low as a decent conversion kit. With a ton of features that make it THE choice for getting into Skibiking and down the mountain! Big jumps, deep powder turns or extreme carving, this Skibike does it all! Glide over whatever comes along with ease. The extra-long suspension travel and tight setup fulfills all the demands of riding safety when it gets rough. Six years of improvements have brought a model with and trusted alloy frame and extra wide wood core skis make in Austria. This year’s edition also features a new one click ski mount system. With the press of a button the skis slide off, making transport a breeze. A new ski retention system has made it possible to ride seated or standing up. The front and rear suspension is equipped with two hydraulic shock absorbers with 210 mm length and adjustable rebound settings. 170mm of travel on the front and 200mm on the rear ski makes the new Freerider an excellent carver. The new skis are wider and will easily float in fresh powder. The redesigned MX-Style seat makes it easy to shift your weight when riding seated but also helps you guiding the skibike when riding stand up. Though this seat has an extra wide sitting area. Closer than ever we met the great feeling of riding a MX-bike. A really safe ride feeling invites you to push limits. 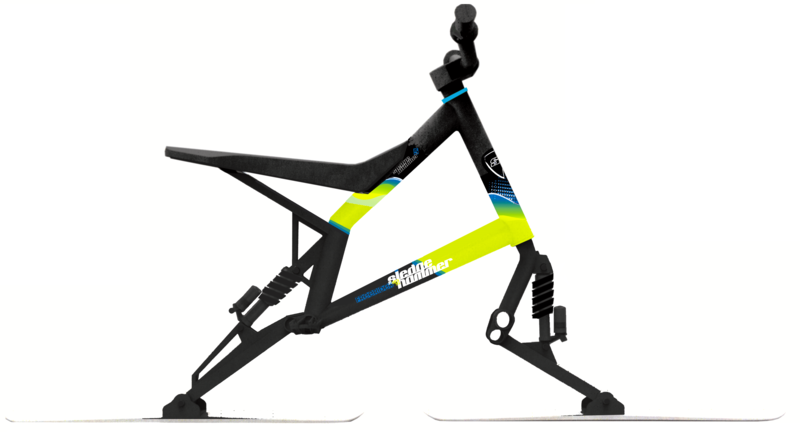 With the use of high quality components, Sledge Hammer created a Freeride machine which is still the best Skibike deal available. At a price level of a conversion kit we offer you an entire top level Skibike. This fun-tool will push your all-terrain winter imaginations.